Biodiesel is a renewable fuel, produced from waste cooking oils, animal fats, vegetable and algae oils. Its use is intended to replace diesel in conventional diesel engines, causing lower polluting emissions. To produce biodiesel, certain details must be carefully considered, namely feedstock composition, reaction parameters, process conditions, process equipment, purification processes, analysis of biodiesel properties, troubleshooting and storage. In what concerns feedstock composition, parameters such as acidity, insolubles, moisture, phospholipids, sulphur, polymerized triglycerides, impurities, etc., must be determined to decide about the pretreatment steps (washing, degumming, filtration, bleaching, deodorization, among others) to be implemented, and the need for esterification prior to transesterification. In what concerns the selection of process equipment some questions arise, namely the materials, heating methods and thermal insulation to use, alternatives to enhance the reaction, need for neutralization and process control system. The purification process includes biodiesel purification, methanol recovery and glycerine valorisation. The excess methanol must be recovered from biodiesel and glycerine by distillation and reused in the process while glycerine can be further purified and sold for application from the chemical to the pharmaceutical industry. 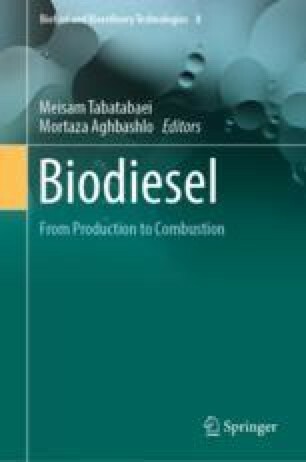 The quality of biodiesel must be certified by the analyses performed according to the standards (e.g. EN 14214, ASTM D6751). Troubleshooting is needed in biodiesel production during start-up and under steady production of a facility; problems may arise regarding quality and appearance of biodiesel, reaction conditions, methanol removal, stirring in reactors, glycerine and biodiesel separation, as well as excess of water and other feedstock impurities. Biodiesel can be stored for up to 6 months; its storage poses challenges concerning degradation by contact with air and light, which cause oxidation. Some additives could extend the lifespan of biodiesel by increasing oxidation stability; other technique is the fractionation to remove the undesired fatty acid methyl ester (FAME). This work was partially supported by the project POCI-01-0145-FEDER-006939 (Laboratory for Process Engineering, Environment, Biotechnology and Energy—UID/EQU/00511/2013) funded by the European Regional Development Fund (ERDF), through COMPETE2020—Programa Operacional Competitividade e Internacionalização (POCI) and by the national funds, through FCT—Fundação para a Ciência e a Tecnologia.